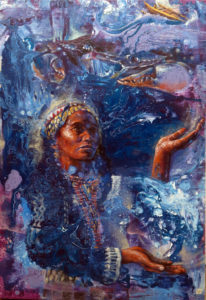 LUYONG BAYBAY is the diwata or deity who controls the tides of the sea of the Panay Bukidnon people of Western Visayas. The Sulod of Central Panay, in Western Bisayas, conceived of the universe as divided into three regions: lbabawnun (upperworld), Pagtung-an (Middleworld), and Idadalmunun (Underworld). The lbabawnun was divided into two dominions—one occupied by the male diwata and the other by the female diwata. The most powerful male diwata was called Tungkung Langit which name means “pillar of the skies.” His origin was not known. He merely appeared in this realm one day and proclaimed his power. He was assisted by other less powerful deities, viz., Bangun-bangun, the deity of universal time who regulated the cosmic movements; Bahulangkug, the diwata who changed seasons; Ribun-linti, god of lightning and thunderstorms; Sumalongson, god of the river and seas; Santon Tiyo, the deity of good graces, and Munsad Burulakaw, the god who had direct power over men. The latter was the most respected and feared among the deities of the Upperworld. The all-powerful female diwata was Alunsina. She was assisted in her activities by many lesser divinities, among whom were Muropuro, goddess of the spring, rivers and lakes; Labing Daut, goddess-in-charge of rain- clouds; Tibang-Tibang, goddess whose charge was to keep the balance of earth and maintain the succession of night and day and so many other heavenly chores. The powerful deity of the Pagtung-an is Paiburong and his wife, Bulawanon. Where these two came from was also not known. They had five children: Ginbitinan, who became the wife of Munsad Burulakaw; Matanayon, goddess-wife of Sulod culture-hero, Labaw Dunggun; Layang Sukla, goddess of beauty, Surangaun, god of the sea, and Tugang Tubig, the god of rivers, streams, and lakes. The lesser divinities of Pagtung-an were headed by Pabuaya and his wife, Durunuun. The Underworld of ldadalmunon, also swarmed with different diwatas. The highest ranking diwata was Panlinugon, the diwata of earthquake. He was assisted by his brother Tungkung Langit (not the same deity from the Upperworld) who supported the world as his name denotes, and his wife, Luyong Kabig, the diwata who controlled the stream of snakes at the entrance of the Underworld. Luyong Kabig had a sister named Luyong Baybay, the diwata who controlled the rising and falling of tides. She married Paigrab, an unknown diwata, and they had one child, Magsanladung Biday.